Short Range T Update- Friday’s sharp decline has brought the blue volume oscillator back down to an oversold condition from which a more extensive bullish oscillator rising bottoms pattern can be generated. 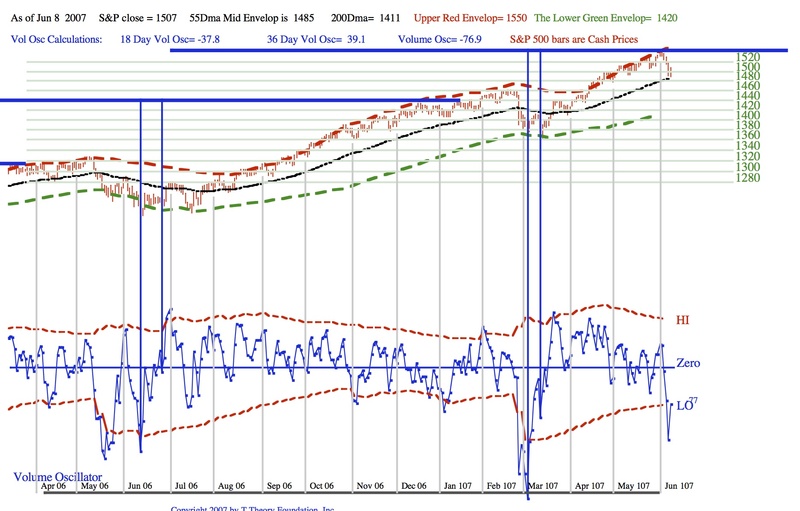 The only requirement to sustain the current Ts projection of strength into the late Fall is to see these corrections hold at the 55 Day Moving Average as noted in the chart by the mid channel black line. I expect this to occur with the T’s basic up trend renewed as we move into July. Next update July 2. 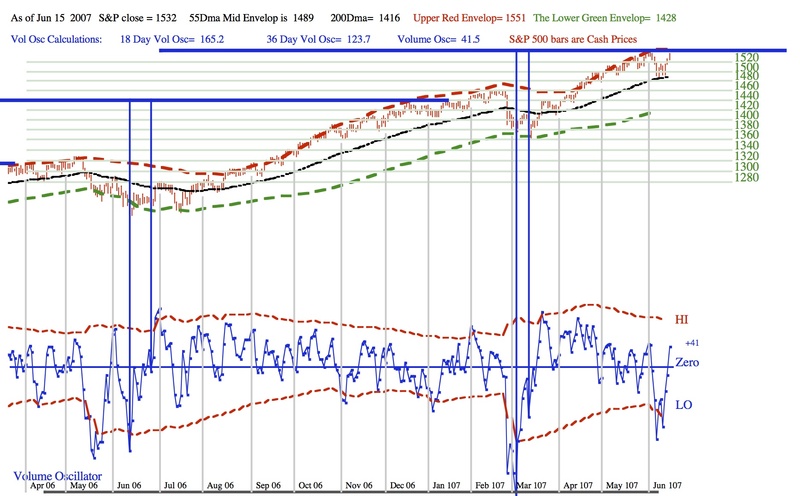 2007 Short Range T Update- Last week’s recovery from the overbought condition can be seen in the PDF file below. Click on this link to see. Note the rising bottoms in the lower plot as the Volume oscillator made a nice rising bottom on the second selloff last week. This is the most common way that daily calculation of the volume oscillator can be used to find buying opportunities. It usually signals a turning of the market’s momentum in an ongoing bull market. The S&P’s turn back up within the right side of the current T should be sustainable going into the July new earnings reporting phase for the 2nd quarter, but I will post a weekly update of the chart on Mondays just to track this T’s progress. However longer term this T projects a run into a November peak. The right end of this T has been cut off by the chart limit, but its influence is long in time. How strong and speculative it becomes remains to be seen. June 11 Update- Last week’s sharp correction from the overbought condition can be seen in the PDF file below. Click on this link to see. The Low ARMS ratio noted in my late May post, plus rising long term interest rates, triggered the sharp drop to the 55 day MA as you can see in the chart. It should act as support and we should see further basing along the MA (S&P 1485-ish) at the worst. 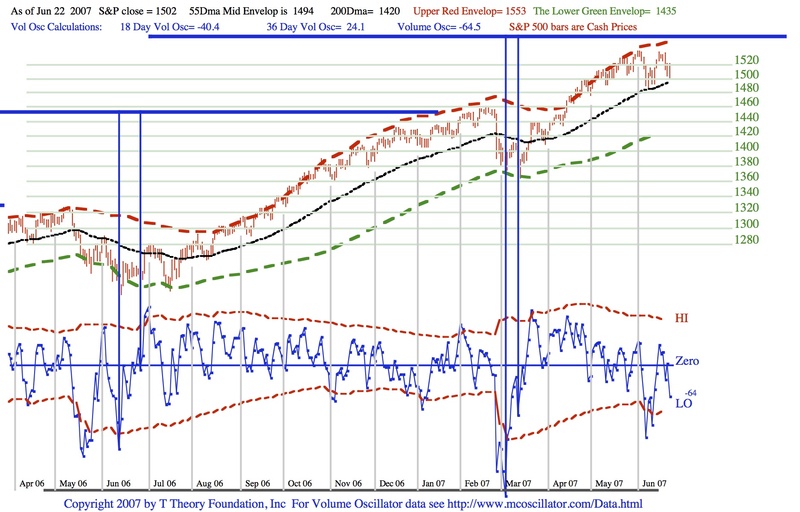 During June I will be discussing my key T Theory conclusion that the market advance into late Fall will result in a significant speculative equity market peak. More specifically my T Theory already claims history will conclude it will be an important from the standpoint of the very long term investor, so it is potentially a very important topic. I believe this is likely to occur by late Fall when the ongoing Ts that I have discussed earlier end their bullish outlook. But judging from history, in order to produce an important equity peak, the current up trend must sustain the kind of advance that encourages and attracts a unique speculative interest. This we need to see as the up trend unfolds. The possibility of a major peak interests me most for the near term because it conforms to the Magic T Complex Theory concept that I developed in 1973 as laid out in my original publication, Principle of the Magic T. Today we are seeing sign of increased speculation in China’s Shanghai market which if continued might help to suggest such a speculative peak. Also we are seeing long term bearish observers of the equity market turning bullish on the major trend after many years of pessimism. For example, Richard Russell, the respected and long term interpreter of the Dow Theory from the 1950’s is now reportedly becoming optimistic on the long term out look for equities. At the same time my T Theory sees an important all time peak coming later this year. Should the general public adopt this bullish expectation of a very long term “new era” of growth for equities, then the T Theory Complex concept I discovered in 1973 will call for a much more severe economic/market decline than the two year post 2000 economic/market contraction. There are a number of ways to resolve this T Theory forecast and I will cover all of them in the weeks ahead so as to be ready from such an event. To initially present and lay the groundwork for future discussions of my early background, using more advanced T Theory concepts, I have reproduced below a xerox copy of a 2 page announcement for my July 18th 1973 talk to a Technical Analyst group in San Francisco in which I discussed the time symmetry I discovered, and how it could be applied to the very long term trends of the market. The quality is poor, however the concept of the Trend Time Advance-Decline line at the bottom of the page 2 plot represents my final, and to this day, the most complete expression of T Theory. It remains my important thinking as it might apply to final speculative market peaks near term that could proceed major depressions. I will be delving into this topic over the next few months using more recent charts. This entry was posted on April 17, 2013 at 12:35 PM and is filed under . . . T Theory®. You can subscribe via RSS 2.0 feed to this post's comments. You can comment below, or link to this permanent URL from your own site.